It was almost a perfect 1, 2, 3 for Spokenforks yesterday atop Mount Etna, but the gutsy effort of Jan Polanc meant he just crept over the line ahead of our tipped winner Ilnur Zakarin, chased home by Geraint Thomas and Thibaut Pinot. 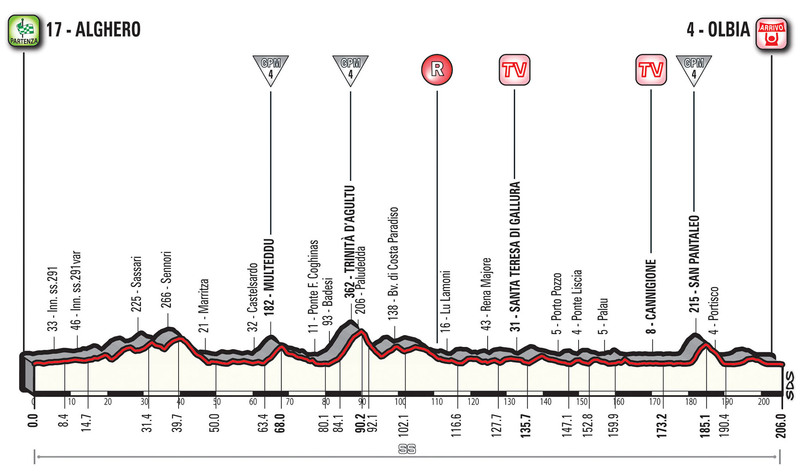 Stage 5 looks to be a return to the hands of the sprinters at this year’s Giro d’Italia, a relatively short 159km from Pedara to Messina, the finale being in the hometown of previous race winner Vincenzo Nibali. 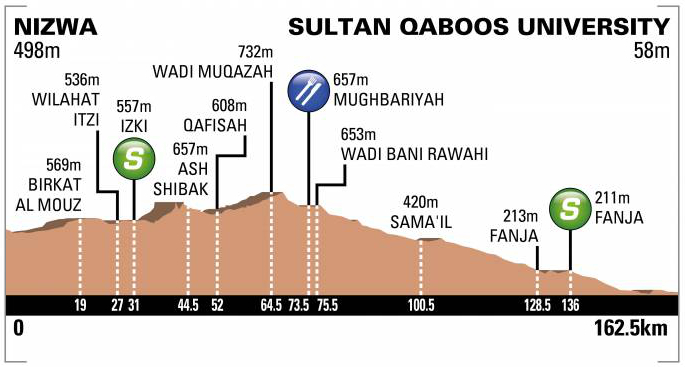 There is a single Category 4 climb to be captured en route to the finish, as the general nature of the race profile is that of a steady descent, which eventually levels out to provide the fastest riders with a 1500m long finishing straight to crown the day’s winner. André Greipel is enjoying some brilliant form right now and has proven to be able to cope with the fierce winds which have struck the race on both Sicily and Sardinia. The German rider will relish this power based finish, one which does not require any stressing as to negotiating late turns or tricky road furniture. His leadout train is not of the quality which we are used to seeing at Le Tour de France, but Lotto-Soudal appear to be overcoming this factor the further the race progresses. Caleb Ewan has been unfortunate to have not picked up a stage victory thus far, the young Australian mostly likely the fastest rider present, has been unable to place himself in a position from which to win from. This drag race to the line is ideal for him to unleash his incredibly rapid sprint finish, allowing his leadout team to focus on getting him up to top speed, rather than seeking to ensure his positioning is perfect. Fernando Gaviria was victorious on Stage 3, though today’s shorter and more simplistic finish could make it difficult for him to better the likes of Caleb Ewan and André Greipel. Gaviria looks to be improving as the stages pass by, acclimatising to the intensity of grand tour racing and finding his groove in the hectic sprint finishes once again. His greatest strength is how rapidly he can accelerate to top speed, making it likely he will try to stay hidden on the wheel of his rivals, before bursting to the fore with the line approaching rapidly. Giacomo Nizzolo is another rider who is finding his form at this year’s Giro d’Italia day by day, though he will have to muster something resembling his best in order to challenge for the win on Stage 5. The Italian road race champion possesses a strong team to support him in the final kilometres, but he could do with a few technical challenges to take advantage of his more powerful rivals. Other names likely to feature in the top ten after Stage 5 are Sacha Modolo, Phil Bahaus, Sam Bennett and Kristian Sbaragli. André Greipel turned in an impressive performance yesterday, surviving the day’s stresses and taking the sprint finish in convincing style to secure his first maglia rosa. Stage 3 is a considerable step down in mileage compared to the opening couple of days, totalling a modest 148km as it covers a relatively flat course from Tortolì to Cagliari. There is little chance of the day’s breakaway surviving, thus the sprinters look assured of another opportunity to duke it out for stage honours on day three of 2017’s Giro d’Italia. 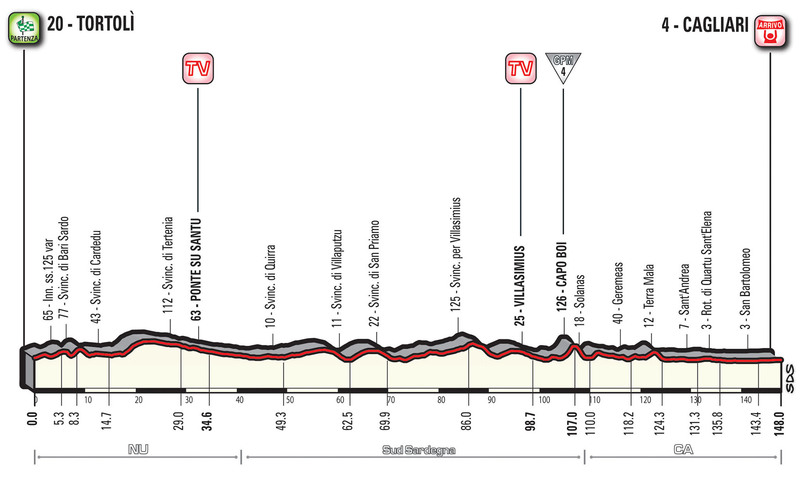 Yesterday’s headwind had an impact upon the race and there will be somewhat of a consideration it may split the bunch during the today’s race to Cagliari as the winds pick up even more viciously; the GC contenders will be nervous. André Greipel pulled off a surprise victory on yesterday’s stage, managing to maintain good condition while climbing, before navigating his way through an ideal sprint finish which saw him dominate the run to the line. 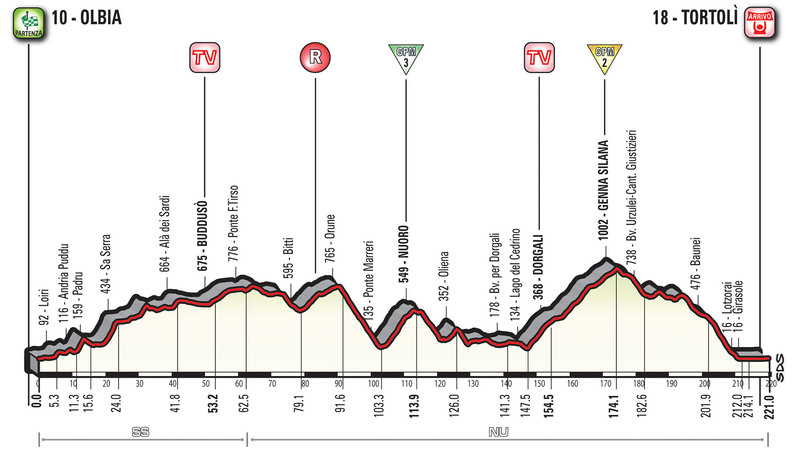 Today appears to be another great opportunity for the German rider to pocket a Giro d’Italia stage victory, the shorter distance and simple finish should provide him with an ideal platform to charge home to victory. Caleb Ewan was unfortunate to bump shoulders with rival Fernando Gaviria, after which he appeared to unclip one of his shoes, removing him from contention for the stage victory. The Aussie is eager to overturn his disappointment from the opening two days and this should be a simple enough day in the saddle for himself and the team. He is the fastest rider here, yet has so far come unstuck due to misfortune, but he should take the win if all goes to plan on day three. Fernando Gaviria has not quite appeared as strong as many anticipated, however he lost touch with his leadout train on Stage 1 and ended up colliding with Caleb Ewan on Stage 2 after launching an early sprint into a headwind. These performances have made it difficult to truly gauge his form at the moment, though it does seem like he is slightly behind André Greipel and Caleb Ewan in regards to high end speed. 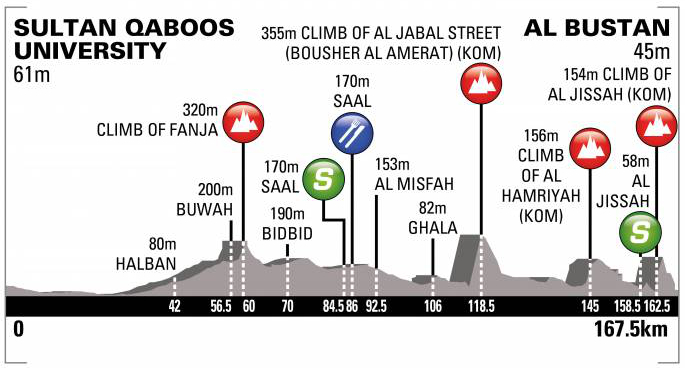 Today’s finish is suiting enough for the Colombian and his Quick Step teammates will be able to conserve a greater amount of energy on this shorter stage. Jasper Stuyven was a surprise presence on the podium yesterday and will be a strong contender to cause an upset if the winds truly begin scything through the peloton. The Belgian rider is highly skilled at surviving the attritional stresses of crosswinds, after which he may emerge as the fastest rider present in a lead group. Giacomo Nizzolo should find the shorter stage distance to his liking as he attempts to ride himself into form during this opening week of the Giro d’Italia. His build up to the race has been far from ideal, making it very difficult to realistically estimate how he will perform on this short and flat stage which is normally favourable for the Italian champion. Regardless, if the expected winds do not prove too decisive, there is every chance he could feature in the mix. Sacha Modolo saw his support man Roberto Ferrari finish second behind André Greipel on Stage 2, the former losing touch with his leadout man and thus allowing his teammate a chance at victory. Normal service shall resume tomorrow, but it will take a huge performance for Modolo to get the better of the three fastest riders here; Ewan, Greipel and Gaviria. Other contenders include Enrico Battaglin, Phil Bauhaus and Ryan Gibbons. The day’s plan was sailing neatly enough en route to the finish of Stage 1 for the sprinters, yet one minor tangle and a rider dropping the wheel left Lukas Pöstlberger to slip off the nose of the peloton, claiming his first grand tour win at his first grand tour appearance. 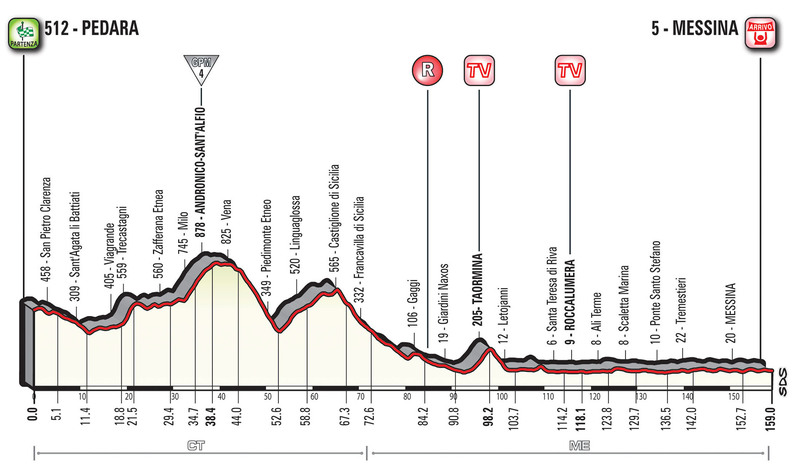 The sprinters shall wish to avoid such a nightmare once again on Stage 2, hoping to seize control of the 221km passage from Olbia to Tortolì, a day which offers little in the way of flat racing until the final kilometres. Those who are able to survive the day’s climbing without having to dig too deep will be the favourites for the win once the race descends towards Tortolì, the run into town featuring roundabouts and turns; the final approximate 2km are simple enough however. Caleb Ewan will no doubt be fuming after seeing Lukas Pöstlberger steal the show on the opening day, the pocket rocket Aussie chasing home the Austrian rider at an incredible rate of knots. His Orica teammates were perhaps most responsible for allowing the win to slip away from them, but should be on the ball once again on Stage 2 in order to compensate for their oversight. Ewan is perhaps the most lightweight of the sprinters and should find the climbing within his abilities, hoping to stay protected in order to preserve his energy for the final kick to the line. Fernando Gaviria lost his leadout train during the final moments of Stage 1 and was left to haul himself up to the front of the peloton under his own steam. The amount of rolling terrain present in the second day of this year’s Giro d’Italia should play into the hands of the Colombian rider more so than any of his rivals. Their misfortune yesterday was not their own fault, so QuickStep are unlikely to be particularly demoralised, leaving them as focused as ever to catch their opening win of three weeks. André Greipel has never particularly enjoyed days like these at grand tours, though the German powerhouse has definitely improved when it comes to climbing in recent seasons. The relatively simple finishing straight is ideal territory for Greipel to dominate, yet it seems doubtful he will make it to the line in contention without having overcooked himself along the way. It may prove more worthwhile to save his efforts today and instead focus upon winning the expected sprint on Stage 3. Giacomo Nizzolo performed well beyond expectation on the opening day of his native grand tour, challenging convincingly for a podium place as the peloton tried to chase down the breakaway Austrian. The tricky technical finale certainly benefited him, but his performance suggests that he could be in the mix once again on the second day. Kristian Sbaragli has looked in good form since finishing the Tour of Yorkshire, not fast enough to challenge the fastest on a normal sprint stage, though has the strength to climb nearer the podium on a day like this. If the day’s pace is not too intense, he may have a chance to seriously contest the finish in Tortolì, though the contrasting ambitions of his team could mean he is not gifted a great deal of protection during the day. Sacha Modolo is another hope for home fans to take the first Italian stage victory of 2017’s Giro d’Italia, even though he is far off the pace of the fastest sprinters, the day’s climbing may drain his rivals enough to bring him into greater contention. Others to consider are Luka Mezgec, Moreno Hofland, Enrico Battaglin and Jasper Stuyven. The evenings are longer, rides are getting warmer and the cobbled classics have been put to bed for another year, but the peloton will have little time to enjoy these glimpses of summer as they face up to life at the 100th Giro d’Italia. Opening this centenary edition of the grand tour upon the island of Sardinia is a 206km trip from Alghero to Olbia, a course which may prove somewhat tougher than many are anticipating for Stage 1. Regardless, it seems likely that we will be afforded the sight of another clash amongst the top sprinters, deciding who exactly shall be the first rider of 2017’s Giro d’Italia to pull on the revered maglia rosa. The finale features several tight turns, road furniture and even small cobbled sections, making this already tense affair a hectic maelstrom in pursuit of the win. André Greipel is the biggest sprinting star present at this year’s race, though plenty are queuing up to usurp him at a race which could see a new sprint star step forth to claim the maglia ciclamino. His form has not been particularly well documented as of late, though his performances during the spring classics were certainly eye catching, even though they might not inform as to his current sprinting condition. His team is strong, but not the ideal line up for the nature of contrasting sprints at a grand tour race and the technical nature of today’s run into Olbia is likely to prove troublesome for the big power sprinter. Fernando Gaviria will favour this rolling day in the saddle which lasts over 200km, while the tricky finish should also play into his hand as he seeks to burst forth with his incredible turn of speed. The Colombian rider may not have the greatest depth to his leadout train at this year’s Giro d’Italia, but the presence of Iljo Keisse, Davide Martinelli and Maximilano Richeze are a potent triumvirate which will prove hard to rival here. His teammates shall not fear an elbows out type of finish, likely to guide Gaviria into an ideal position to unleash his sprint. Caleb Ewan is another young sprinter who has rapidly burst onto the scene and risen immediately to the top ranks in a short period of time. He has turned in consistent performances throughout the start of this year, even if he has not always managed to convert his best opportunities into victories and shall be a true contender for the overall points competition. Like Greipel, his leadout is not quite a perfect selection, but there is no doubt Ewan shall be a front-running rider for the race’s opening stage on Sardinia. Giacomo Nizzolo has not enjoyed a good build up to the Giro d’Italia this year, suffering from a knee injury which has limited his performances and training for sometime now. Though a serious campaign upon the points competition is likely to prove too much for a rider with so little racing as of late, Nizzolo normally enjoys these complex finishes and it would not prove a great shock if he does end up in the mix. Sacha Modolo will be short on supporting firepower compared to recent appearances at his native grand tour, but is another who tends to muster his strongest form when battling on these snaking narrow roads. It will be tough for him to navigate through the pack late on, so positioning will be crucial if Modolo is to stand a chance of crossing the line first, though he is skilled at transforming a glimpse of hope into a victory. Others who may also feature are Sam Bennett, Kristian Sbaragli, Phil Bauhaus and Daniele Bennati. 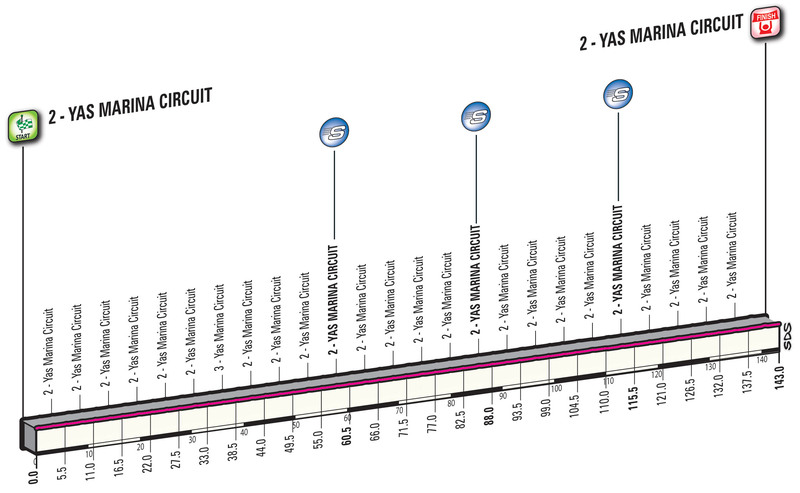 The final stage of this year’s Abu Dhabi Tour is a 143km criterium style affair, comprising 26 laps of the Yas Marina F1 race circuit. Silky smooth tarmac and sweeping turns look to be ideal conditions for another bunch kick to draw this year’s race to a close and likely crown Tanel Kangert 2016’s champion. The final few turns could cause problems for a few of the sprinters as the finishing straight does not come until 250m from the line; positioning will be crucial to have any chance of winning here. Mark Cavendish took the win on Stage 2 and shall be favourite to do so again on the final stage as a result of André Greipel’s withdrawal ahead of the start on Stage 3. Dimension-Data have already demonstrated their ability to navigate Cavendish into position despite their smaller squad size and are certain to be the wheel to follow heading into the final metres. Giacomo Nizzolo took advantage of his late season form when winning Stage 1, catching several of the bigger name sprinters napping by latching onto the Dimension-Data leadout to slingshot himself to victory. This finale should suit him even more, the late final turn making it a contest of positioning and acceleration instead of pure speed like we saw on the opening two stages. John Degenkolb bailed out of the sprint on Stage 2 due to some risky moves from other riders heading into the last turn and will be hoping he can makes his time here worthwhile with a win on the final stage. His leadout is one of the strongest here, but has not necessarily shown enough when it matters most to truly hammer home this fact. Elia Viviani was left disappointed by Cavendish’s win on Stage 2, having already stated that he shall be out for revenge on the final day to reverse his fortunes. The Italian has an explosive acceleration and his race craft honed on the track means his positional abilities to hit the front at the key moment are always a threat to rivals. Others who could all challenge for a podium place are Andrea Guardini, Magnus Cort Nielsen, Christopher Latham and Steele Von Hoff.